Stud bolts are available in ASTM Grades B7, L7, B16, B16M, L7M, B8, 660 and B8M; they are also available exotic metals such as Monel, Titanium, Inconel, Alloy 20, and Hastelloy, 17-4PH. These studs are also available with industrial coatings such as SermaGard, Xylan, PTFE, Fluoropolymers and other coatings. 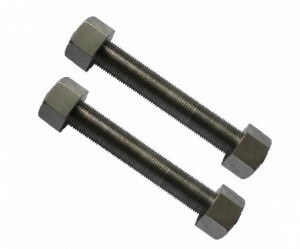 Stud bolts are threaded end to end and are often used for flange bolting with two nuts on either end. There are two types of these studs. Type one – usually for general purpose; the length of stud is measured from end to end. Threads are UNRC-2A. Type two – studs for high temperature pressure piping. These studs are made to dimensional standard requirements of ANSI B16.5 the length of this stud is measured from first thread to first thread, exclusive of points. Threads are UNRC-2A for sizes 1 inch and under and 8 UNR-2A for sizes over 1 inch. The length of stud bolt, measured parallel to the axis, is the distance from first thread to first thread. First thread is defined as the intersection of the major diameter of the thread with the base of the point. At Sigma Fasteners we provide mission critical bolting products for the nations leading manufacturers of pressure control equipment for controlling pressures during drilling and oil production. Double-end studs used by many of these manufacturers have equal-length threads on each end to accommodate a nut and are threaded to a Class 2A fit. Length of stud is measured overall. Both ends have chamfered points, but round points may be furnished on either or both ends at the manufacturer’s option, This style is furnished in the same four types listed for tap-end studs. Double-end studs are used for flange bolting or other applications where torching from both ends is necessary or desirable. Most steel grades not heat treated or quenched and tempered can be furnished on special order for production quantities. Only the Type 2 continuous thread studs made to specification ASTM A193 grade B7 are stocked in a full range of sizes. Sigma Fasteners manufactures Tap End Stud bolts to your print, Tap End Stud Bolt Standard or AWHEM Standard in all ASTM grades. Tap end studs have a short thread length on the tap-end side typically threaded tor Class UN-3A fit. This side is screwed into a tapped hole. The nut end of the stud is threaded with a Class UN-2A fit. Length of the stud is measured form end to end. The tap end has a chamfered point, but the nut end may have either a 30° or 45° chamfered end or round raduised end, at the customers option.The tap end can be measured from the end to last scratch, end of the chamfer to the last full thread or any combination of last scratch, last full thread, end or end of chamfer. ASTM B7, B7M, B8, B8M, 660,718, 17-4ph, MP35 and more. Unfinished, SermaGard, Xylan, PTFE. Moly, zinc or cad plated. Sigma can lower your cost for tap end studs with contract pricing or managed inventory. Stud bolts for high pressure & high temperature applications conform to the requirements of ANSI/ASME B16.5, Steel Pipe Flanges and Flanged Fittings. Length, in. Length Tolerance, in. Points shall be flat and chamfered, or sheared at option of the manufacturer. When points are flat and chamfered, the diameter of the flat shall not exceed the minor diameter of the thread, and shall be not less than one or more than two complete threads as measured from the extreme end parallel to the axis. Threads shall be Unified inch coarse thread series (UNC), Class 2A, for all stud bolt sizes 1 in. and smaller, and Unified inch 8 thread series (8 UN), Class 2A, for all stud bolts larger than 1 in., in accordance with ANSI/ASME B1.1. Acceptability of screw threads shall be determined based on ANSI/ASME B1.3. Chemical and mechanical requirements shall be specified by the purchaser and shall be in accordance with applicable ASME, ASTM, and ANSI codes and specifications current at the time of ordering. ASTM Material Selection Chart – Stud bolas are available in ASTM A193 Grade B7, B7M, L7, L7M. As well as 660, 718 Inconel, Mp35N and other high nickel alloys and stainless steels. 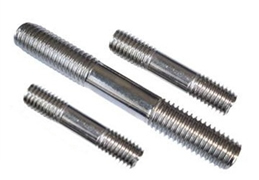 It is recommended that stud bolts be designated in the following sequence: product name, nominal size, threads per inch, length, material, and protective finish, if required.